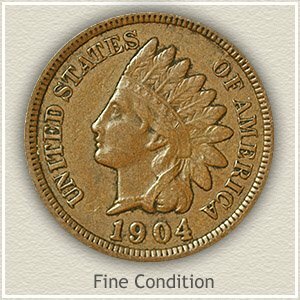 Collector demand is causing your 1904 Indian head penny value to rise. It is a very popular collectible. Indian penny collections are often started with the years 1900 thought 1909, forming a nice sub-set within the long running series. Also, since many examples of these are available the focus is on better condition coins. 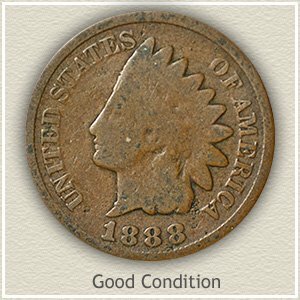 Inspect your coin, if the feathers in the headdress are nicely detailed there is potential your 1904 penny is worth well above the minimum. Pictured is an exceptional and rare 1904 penny, never circulated, still bright with all the original detail as minted. Value of top quality survivors often tops $100. Accurate value of your 1904 penny is found by judging its condition. Collectors and dealers examine the amount of wear to the surface and a "grade" is assigned. Below the value chart compare your coin to the descriptions and images identifying different stages of wear. Quality of preservation allowed this 1904 Indian penny to reach a value of $404 at a David Lawrence rare coin auction. Obviously treasured and well cared for in a collection from the year of mintage. Minimum contact with air and other coins has left the surfaces in pristine condition. Today's and future collectors have a remarkably well preserved classic penny. Handle all of your old coins gently by the edges. Recognizing value by dates and condition combined with shielding your coins from harm and the effort will pay off in the future. 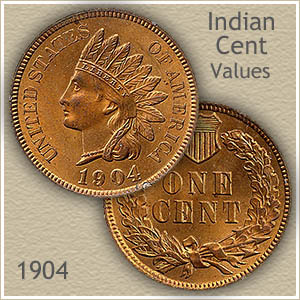 Indian pennies are an important part of early classic US coinage. A coin widely collected and your care insures its solid value. Higher 1904 Indian head penny value is discovered if the finer details of the design are remaining. The varying degrees of wear to the surfaces are judged and a "grade" is determined. The value chart highlights these different grades and values. Uncirculated: Immediately after minting this 1904 penny still in "uncirculated" condition was put away and never used. The highest parts of the design have not been disturbed by wear. Check the Indian‘s cheek, hair and ribbon below her ear and the tips of the feathers. If there is any wear, these areas show a smooth and flatness to the surface. Extremely Fine: Although lightly worn, if the small details remain your Indian penny is considered in "extremely fine" condition. Zoom into the head band, notice all letters in Liberty are readable and fully separated from the band. Slight wear is present, however all parts are bold. Your coin should stand out as very pleasing to the eye and highly detailed. 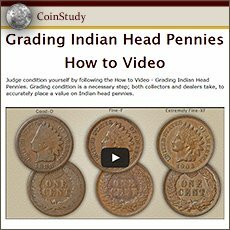 Fine: As a collectible coin, 1904 Indian head penny value is twice lesser grade examples. Moderate wear has developed, however ample detail remains. A solid example of the "fine" grade. The highest details are worn but not to the point of merging. Ribbon detail behind her neck is still separated from the hair, although worn smooth as it crosses. Her forehead is fully defined and apart from the headband. Furthermore, despite obvious wear the headband still portrays "Liberty." Good: Noticeable and extensive wear is referred to as "good" condition. As you scan around the rim, it is important all lettering is visible. Although the portrait is very worn the bold design is clearly separate of the surface. Few details of the headdress remain, feathers are just an outline and the headband is obscured. Her facial features are very faint, the eye does have some depth and the cheek is faintly separated from her neck. If a small amount of roundness is visible to her face your 1904 Indian head penny value is slightly higher. A very popular coin, the value of an Indian Head penny is on an upward trend. Common dates are now worth $1 each. Many collectors are building collections and putting a heavy demand on the rare dates and better condition coins. 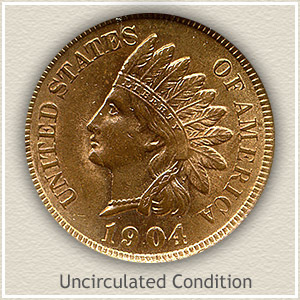 Find not only your 1904 Indian head penny value but all dates in the series are listed on the chart. Accurate old US penny values are found by using the grading images to judge condition then checking the date and values on the charts covering each series of US pennies. Discover all the rare varieties, dates and mintmarks.